INDEPENDENT FREIGHT FORWARDER ARE TAKING MARKET SHARE FROM THE MULTINATIONALS. These are the questions that our research will answer and in so doing provide much need insight in to what BCO’s can expect from the sector and more importantly what independent freight forwarders need to do to take advantage of these new more profitable opportunities. The research program will take 2 years to complete (2015-17) with preliminary findings being published in June 2016. Interim findings are leveraged to give final direction to the research process and responds to intelligence gathered in the process to date. What is the typical profile of the IFF that BCO’s are looking to? Traditionally, the freight forwarder spoke directly with clients and warehouses around the world to arrange the movement and storage of freight. Today, the description of a forwarder has become far more complex. They now take this information and pass it along to the appropriate party whether that be the carriers, third-party service providers, Custom agents, or the shippers themselves. Along with making certain that the freight gains entry into the country, a forwarder must now arrange for cargo to be picked up and delivered to the final consignee’s place of business. This requires contacting trucking companies, rail lines, or even sometimes exporting the goods to a different country for final delivery. This complexity has created new opportunities for the independent freight forwarder to upgrade their services and IT capabilities in order to keep up with growing demand. What do independent freight forwarder needs to demonstrate to attract this business? Freight forwarders have to become smarter and more efficient – in an environment where manual data entry is still widespread – but they will have to enhance their commoditized offerings. For some, this means developing their levels of expertise in niche sectors in order to differentiate their services. Others will evolve from pure forwarders to fully developed logistics providers, increasingly serving customers with integrated logistics services. The technology systems they offer will be critical to their customer proposition. The major market challenges that freight forwarders face today are becoming even more daunting as their basic services turn into commodities and the competition gets more intense. To become a best-in-class company in this environment requires thinking and performing outside the box. The more services the forwarder provides, the “stickier “its relationship with the customer. Unless these industry dynamics are addressed and soon, freight forwarders will be condemned to competing in an industry in which slashing prices is their only competitive option. What is best practice in customer interfaces, track and trace facilities, global partner networks and other value-add services? How are these services delivered? The days of opening a generalized freight transportation business may be over in favor of a more focused and specific transportation approach, that includes offering additional services that complement the transportation of the box itself. These may include warehousing, local distribution, pick and pack, or some form of commodity assembly before shipping. However, the sensitive, personal touch is always in demand and appreciated by customers who are not willing to be an anonymous entity with their freight company. Executive Summary: The Executive Summary section is a brief summary of the overall chapter. Key External Drivers : The Key External Drivers section looks at the key factors outside the control of an individual business that determine the industry’s performance. Current Performance: The Current Performance section provides analysis for the industry over the past five years with key performance indicators discussed. Industry Outlook: The Industry Outlook section is a key analysis section of the report and outlines expectations for the key industry indicators over the next five year period, including forecasts. Industry Life Cycle: The Industry Life Cycle section provides a discussion of where the industry is at in its life cycle and how that is affecting industry performance. The Demand Determinants section provides an analysis of the determinants behind the level of demand for the industry’s products. The Major Markets section gives an analysis of the markets for the industry’s products and how these markets may have changed over time. The Market Share Concentration section discusses the level of concentration of the industry. The Key Success Factors section looks at the key internal factors that contribute to the success of an operator in the industry. The Barriers to Entry section looks at the factors preventing new companies from entering the industry. The Industry Globalization section provides an indication to which the industry is affected by global operations and trends. The Structural Risk Index section provides an indicator of the level of risk faced by operators in the industry. The Investment Requirements section is an analysis of the level of capital investment required to operate in the industry. The Technology & Systems section discusses the key technologies used by the industry. The development of stronger human – machine interfaces, has the potential to increase supply chain efficiency and reduce susceptibility to costly errors. The Industry Volatility section looks at the level of in the industry and the factors behind this volatility. The Key Statistics chapter provides the key indicators for the industry. The statistics included are industry revenue broken down in to trucking, rail, air, sea, warehousing and value added services. The Market Briefing Chapter profiles each of the key markets around the world and provides the reader with an insight in to the local independent freight forwarding industry. There are key differences in how various networks operate, largely driven it seems by their genesis and raison d’être. 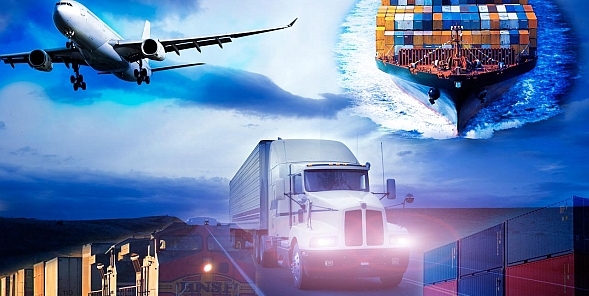 Can networks of independent freight forwarders combine to provide global beneficial cargo owners with a single solution? 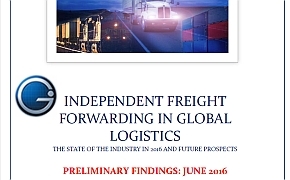 The report will include a series of case studies and profiles on leading independent freight forwarders. The collection of case studies will be drawn from a cross section of regions and verticals. Institute researchers will be in contact with many of the key actors in the global independent freight forwarding industry as part of their work. As a result, the final report will include a series of case studies of "Best in Class" Independent Freight Forwarders which will complement the report by presenting case studies which reflect the evolution of the industry. These reports will vary, from region specific to vertical specific and be drawn from what our researchers determine as the "first movers" and "thought leaders" in the independent freight forwarding industry. 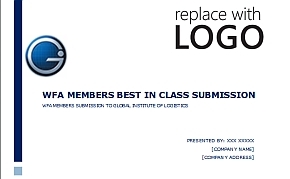 Those organizations invited to participate in the final report will be accredited with a "Best in Class" designation and included perpetually in GIL's accreditation register. 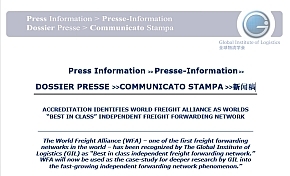 The World Freight Alliance (WFA) has been named the benchmark Independent Freight Forwarding Network globally.The announcement comes as a result of the Institute’s preliminary findings from its research study Independent Freight Forwarding in Global Logistics. The findings indicate that one of the key drivers prompting BCO’s to work with independents is their provision of personalized bespoke services combined with access to global independent freight forwarding networks. Therefore for independent freight forwarders, membership of a global network is crucial. Network membership enables freight forwarders to form relationships with other freight forwarding companies, gain access to their resources and link with their activities all critical in connecting BCO’s to international supply and distribution networks. Combining their resources and activities with those of other freight forwarders will result in BCO’s materials moving faster at lower costs with superior customer service than competitors. However not all networks are the same and that is the challenge for freight forwarders, how to go about identifying the correct network to partner with and having chosen a particular one, how to make membership work for both the company and its clients. Such is the significance of network membership for BCO’s in choosing an independent, the Institute’s final report will include a comprehensive overview of how such networks operate. To date there has been very little in the way of research on how successful freight forwarding networks operate. As a result BCO’s and freight forwarders have access to very little information when evaluating the market place. The Institute will address this knowledge deficit in its final report. Our approach was to first identify a benchmark network to research and for this the Institute has chosen the World Freight Alliance. The alliance has agreed to cooperate with GIL in the next stage of the research process which will give our researches unique access to the alliance and its members. WFA members demonstrate commitment in relationships which over time has led to the development of interdependent activities, increasing the level of mutual productivity. WFA Network relationships are founded on strong conviction and mutual commitment to excellent service when dealing with the handling of a client’s freight. Personal relationships between WFA members have been developed through informal daily contacts, and through formal network meetings, which in turn has generated ties that contribute to the creation of a sense of belonging and commitment to the network. 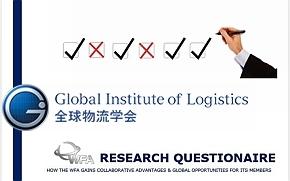 The Global Institute of Logistics Announced Today That It Has Begun Researching The State of Independent Freight Forwarding And its Future Prospects. The Research Will Be Published In 2016. 2014 figures from Drewry consulting show that 41 per cent of all ocean freight is now controlled by 3PLs or forwarders and by the end of the decade analysts are predicting that the market share will rise to 50 per cent – a remarkable switch in business practice by BCO’s over the past two decades. 20 years ago some 75 per cent of all sea freight volumes were booked directly with carriers. Carriers due to the huge downward pressure on rates are being forced to increasingly commoditized their product. As a result carriers are increasingly incapable of meeting shipper’s needs through direct relationships as they lack the end to-end service supply chain capabilities, focusing instead almost entirely on cost. Sales and customer service teams have been slashed as the fight to the bottom on rates continues. The advent of super alliances has further eroded the personal interfaces between the shipping lines and the end customers. What is best practice in customer interfaces, track and trace facilities, global partner networks and other value-add services.